January 21, 2017. According to The New York Times, “women gave a march and the whole country showed up”. 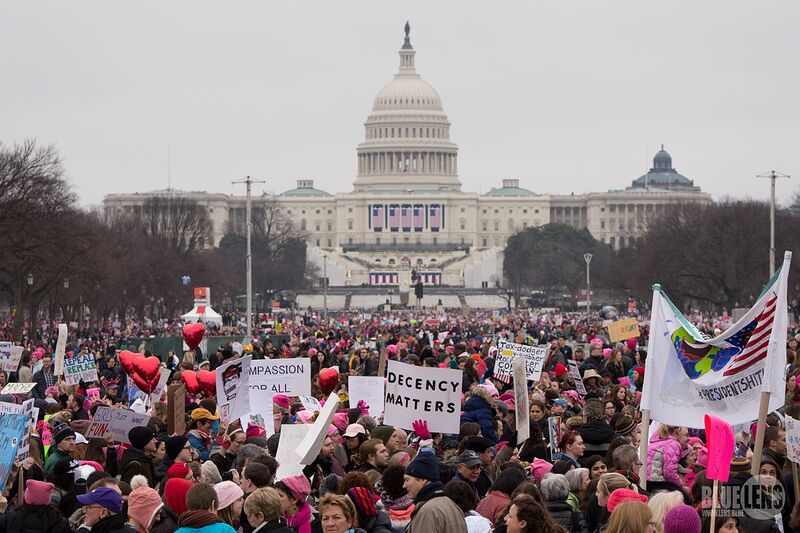 More than 500,000 women and men marched yesterday in Washington D.C. defending the central message of the Women’s March movement: women’s rights are human rights. The organisers were also sending a bold message to the new Trump administration and against misogynism, sexism, and prejudice that were part of Donald Trump’ speeches during the last electoral campaign. For those who could not go to the US capital, there were several of US cities organizing sister marches to ask for human rights protection (see here some strong photos of yesterday’s March). This March has already been compared to the 1963 March on Washington D.C., when civil rights activist Martin Luther King delivered the “I have a dream” speech. On January 16, 1963, between 200,000 to 300,000 people asked for the end of racial segregation. This March led to the Civil Rights Act of 1964, which excluded any kind of discrimination based on color, race, gender or nationality. On its website, the Women’s March on Washington states its mission and vision, calling for non-violence: “we stand together in solidarity with our partners and children for the protection of our rights, our safety, our health, and our families – recognizing that our vibrant and diverse communities are the strength of our country”. There were some celebrities that joined the March and promoted it for several days, such as Scarlett Johansson, Olivia Wilde, Miley Cyrus, Jaime Lee Curtis, Rihanna, Amy Schumer, Hillary Clinton, Jennifer Lawrence or Charlize Theron. The word and values spread out all over the world and several countries joined the movement. At least 620 marches in 50 US states and 32 countries. The LGBTQ community, Native Americans, Africans, Asians, Muslims, Arabs or Hispanics, all marched with women to promote and improve their rights and to make a statement to the new administration: we are here and we won’t abdicate of our rights. People in other countries joining the Women’s March movement asked for gender equality and parity, reusing Hillary Clinton’s quote on 1995 UN Fourth World Conference on Women in Beijing: “women’s rights are human rights and human rights are women’s rights”. Gloria Steinem, the 82-year-old feminist and political activist who became a symbol for the feminist movement during the 1960s and 1970s, stole the show with an amazing speech, asking for unity, strengthen and compassion. Steinem remembered the Berlin Wall and Poland’s struggle over abortion: “just this march in Washington today required 1,000 more buses than the entire Inauguration. A thousand more buses. And I was just talking with people from our many sister marches, including the one in Berlin, and they asked me to send a special message: ‘We in Berlin know that walls don’t work’. And remember Poland where last month the government passed an anti-abortion law and six million women turned out on the streets and they had to change it. We are the people. We have people power and we will use it”. Also Madonna, woman of the year for the Billboard Women Music in 2016, addressed the crowd: “welcome to the revolution of love”, she started. The singer appealed to pacifism, saying “I have thought an awful lot about blowing up the White House, but I know that this won’t change anything”. Donald Trump can build all the walls he wants. And so can Russian President Vladimir Putin or French Presidential candidate Marine Le Pen. Or the former Bulgarian Prime-Minister Boyko Borisov. Citizens all over the world know their rights. They have civil society organizations ready to help them achieve equality, promote democracy and spread human rights. Just “Don’t Let Anybody Tell You the Marches Didn’t Matter”. Yesterday, I saw women empowerment in every country. I saw respect and support for every person and it made me believe this is a wonderful time to be alive. Four years of Trump will bring out the best on American people, in all of us. Don’t forget the HeForShe motto: “what we share is more powerful than what divides us”. The rise of human rights just started yesterday. Photo by Mark Dixon from Pittsburgh, PA, CC BY 2.0. ← Obama Out, Trump In: What Does The International Press Say?